Oregon is justifiably proud of its natural wonders and its culture is idealistic in the best way—so it’s no surprise that the state also has some solidly pro-solar policies that make it easy to set up your own home solar panel system. Once you do, you’ll not only save a lot of money, you’ll also be helping to protect the places that make Oregon great. 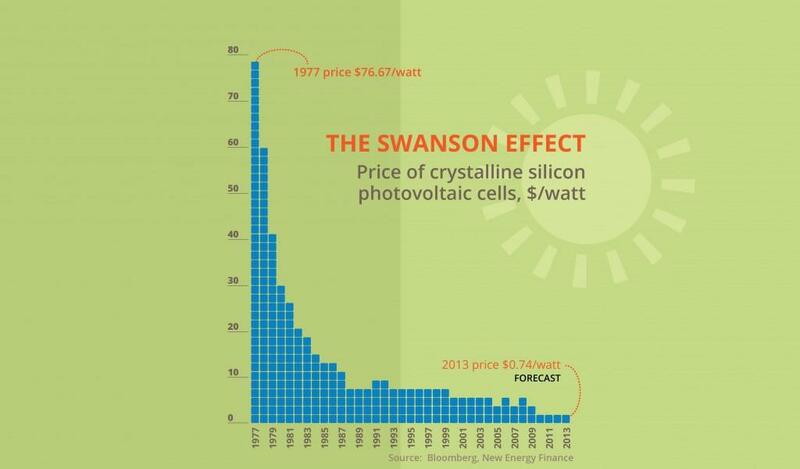 Swanson’s Law was first articulated by Richard Swanson, a business leader in the solar industry. The law states that for every doubling of global solar equipment production, the price of that equipment drops 20%. That’s good news for the rest of us, because it means that home solar systems have never been cheaper to buy and install. There are 3 options for paying for a solar installation which are leasing, cash purchase, or purchase by credit. 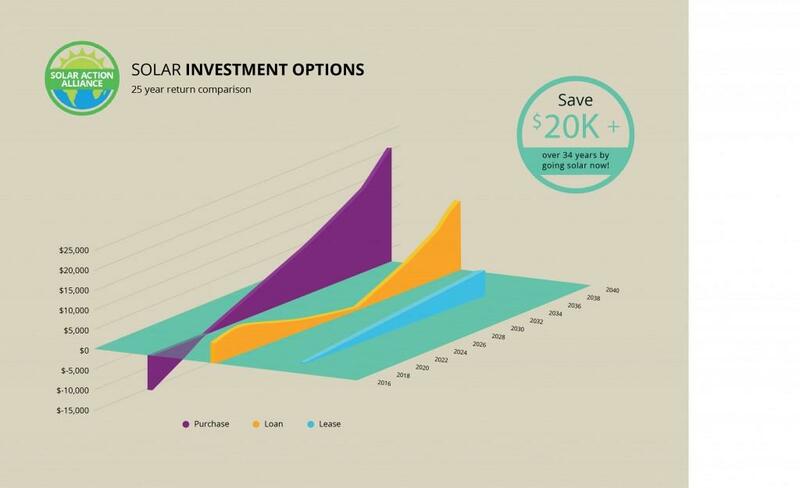 See the graph to compare your return on investment for each, for a hypothetical 5kW system. The average annual electricity bill before installing solar is approximately $1,200 but once you start using solar panels you can expect savings of around $540 annually, depending on which purchase or lease option you choose. 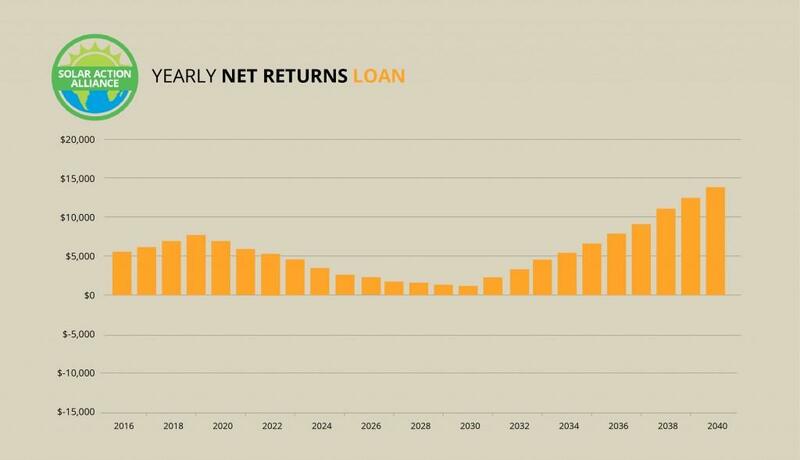 In most situations, if you have the cash available or you can access secure financing, the installation is an investment with a likely return that is even better than mutual funds. In addition, there’s significantly less risk as the energy credits you gain are linked to the sun rising and not to the financial markets. 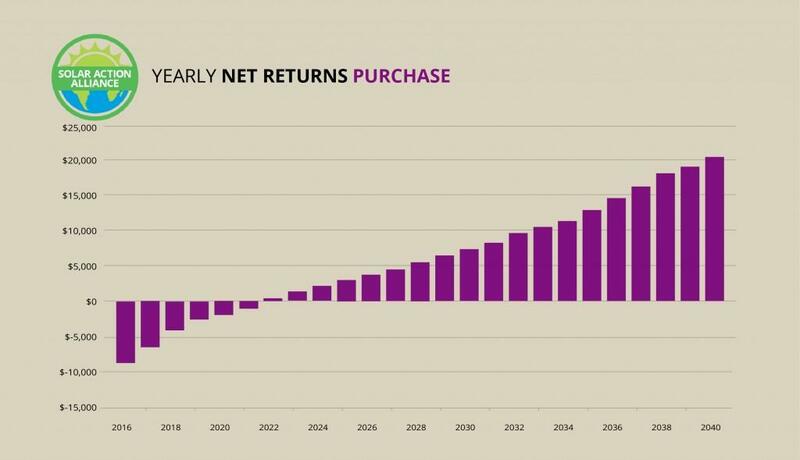 Purchasing with cash requires a significant initial investment, but also gives you the best return on your investment over time. And with plenty of state and Federal programs to help lower your costs, the system can pay for itself quickly. Households that purchase their own solar installation can get a lump sum rebate from Oregon that is designed to promote the solar panel industry and create jobs. You also get both state and Federal tax exemptions for part of the value of your system. With these benefits and the money you save on your electricity bill, your system could pay for itself in as little as eight years. Some municipalities and energy companies offer their own incentives, which may or may not be compatible with what the state offers. Plus, the value your solar panel system adds to your house is tax-free. 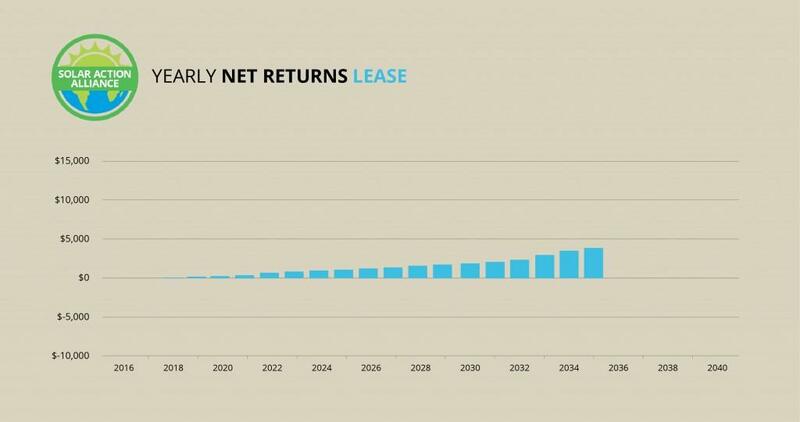 If you are eager to go solar but you don’t have the cash, you can start the ball rolling with a lease. You benefit because you have no immediate costs and a reduced total electric payment. This seems to be a great option. The only disadvantage is you don’t own the solar panel system. With leasing you will not be able to take advantage of all the performance payments and credits you would get if your own your own solar installation system. But then, if something breaks, you don’t need to pay to have it repaired, either. If you are determined to find the money for your solar panel installation you don’t need to despair as the outlay is really not that much. As long as you have some collateral in your own home you will be able to get a loan and start saving on your renewable energy source straightaway. Buying with a loan entitles you to all the incentives you’d get if you paid in cash, plus you don’t have to pay any money up front. In fact, depending on the size of your system and how much electricity you use, you might never have to pay any money, since your loan payments will be less than the electric bill you used to pay. You come out ahead. 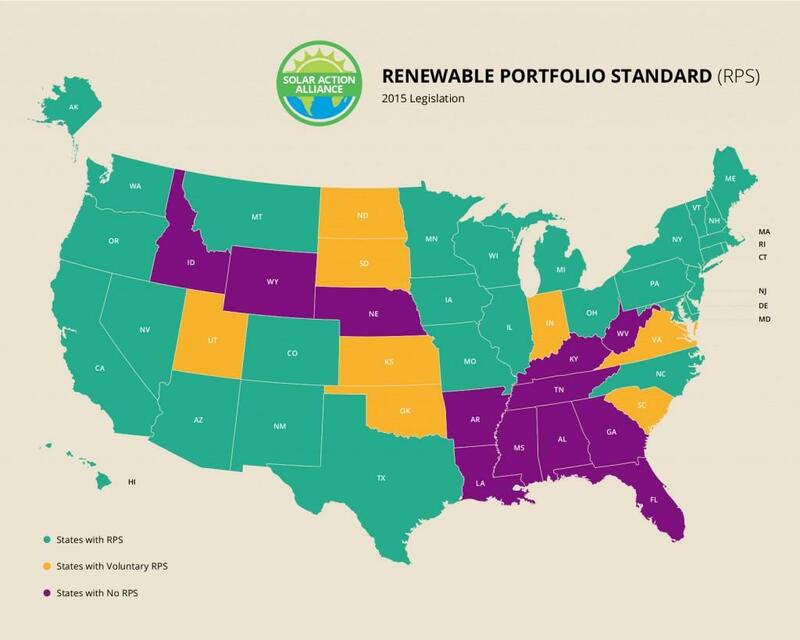 The initiative called the renewable portfolio standard (RPS) requires utilities to get a certain percentage of their power from renewable energy resources such as wind and solar. Oregon’s renewable portfolio requirements are ambitious, demanding that large utilities by 2025 achieve 25 percent of their electricity requirements from renewable energy installations (and that does not count the state’s hydropower!). Moderately sized utilities are required to achieve a 10 percent goal by 2025, while the smallest utilities only 5 percent by 2025. These demands mean that every utility must participate in Oregon’s renewable future. One way they can do that is by helping you go solar with rebates and other incentives. 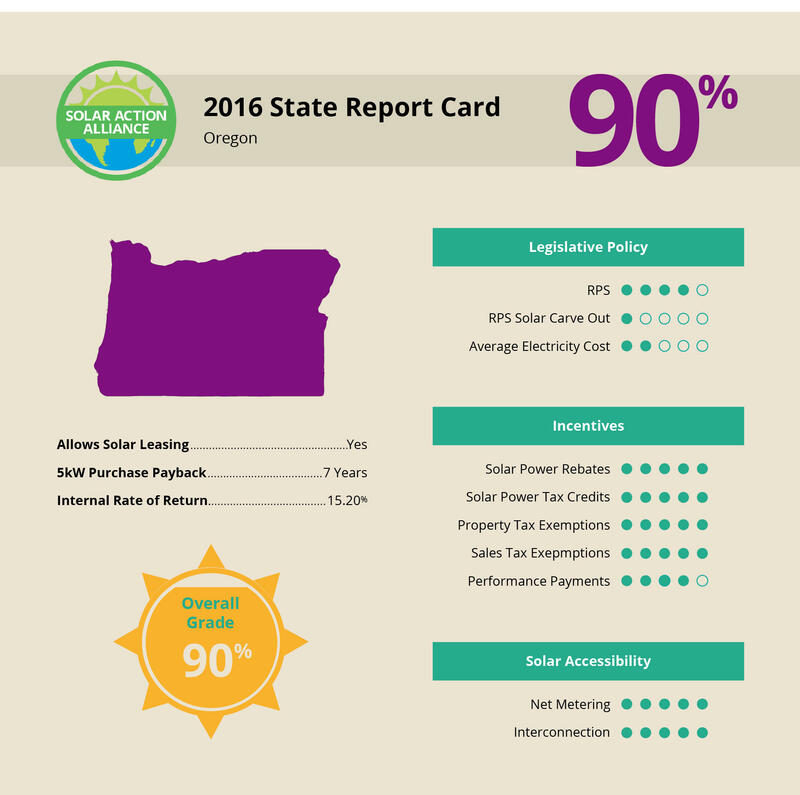 Oregon does very well as a pro-solar state. It has a strong RPS law, great incentives, like tax credits, rebates, performance payments and both property tax and sales tax exemptions. A strong interconnectedness policy makes it easy to hook your system up to the grid, and a statewide net metering law means you get credit for all of the extra electricity you generate but do not use—the only downside is you can’t keep your credit over from one month to the next, nor do you get a check. So if you use more electricity than you generate one week, you can cover that by generating more the next, but if you average out as a net producer of electricity by the end of the month, you don’t get paid for it. The only two blemishes on the state ‘s grade are that it has no solar carve-out—no percentage of its commitment to renewables must be in solar, and it has low electricity prices. Cheap electricity means you don’t save as much by going solar. In most states cheap electricity is also a sign of dependence on cheap and dirty coal, but in Oregon electricity is cheap because of hydropower—not a perfect technology, but its carbon footprint is excellent. All in all, Oregonians can give themselves a pro-environmental pat on the back. The state is a great place to go solar, and a good example to the rest of the country.